Good morning and welcome to this weeks SOS. Garden time has been pretty sparse this week. The nights are drawing in fast and I have been late home from work a couple of times. I have managed to move a few hardy d welcome to this week’s SOS. Garden time has been pretty sparse this week. The nights are drawing in fast and I have been late home from work a couple of times. I have managed to move a few hardy perennials around last weekend. I have moved some of the taller perennials to the back of my herbaceous border and moved a couple of Salvias forward ready for next year. I have also received an E mail saying that I am going to receive 5 hardy perennials sometimes next week. I forgot I had ordered them. TBH I have no room to put them so might have to make it part of my sister’s Birthday present next month. Succulent wise I have potted a few plants into bigger pots and I have taken some cuttings and leaf cuttings. I am not sure if September is the best time leaf cuttings of succulents but it should be a worthwhile experiment. I will keep you posted of how it works out in my blog. I have managed to secure some space in a greenhouse over the winter so I am going to over winter some of the more tender succulents there. Here is this week’s six. 1. Dry trough showing signs of autumnal colours. This has truly has been a success this year. From the Sempervivum flowers in the late spring and the changing colours and shape of the succulents throughout the year. In this photo you can see such varieties as Sedums Cape Blanco, Sedum purpureum, Sedums Oreagum, Sedums Dasphyllum, different varieties of Semps, a Echeveria Worfield wonder (centee left) amd a couple of Saxifrage. I am definitely going to make another dry trough next year and keep this one going. The thing I like about this is how easy it is to change things around. I move things from other pots if they are performing well and conditions in the trough change the way the plants grow. The plant can show different colours, different grow rates and different shapes from the original plant somewhere else in the garden. I use 50% grit and 50% general compost. I can’t remember what variety of Nasturtium this is but it is going great guns. Not a prolific flowerer but the foliage wise I can’t complain. Perhaps I should have cut them back a bit a few weeks ago to encourage more flowers. As f9r Rudbekia it always does not disappoint. They always add a splash of colour on the darkerSeptember mornings. In my view a staple for any garden. There are the 6 Echeveria’s I bought at Surreal Succulents when I was on holiday in Cornwall. Good quality as always. These are slightly tender than I would normally buy but I am keeping these next to the house and beside a hedge so they should be fine at the moment. The trough was an impulse buy at a garden centre. I really need to reign my impulse buys in during Autumn…….it’s going well I only bought 4 tender Sedums from Ebay last week! Another purchase from Surreal Succulents. I bought this plant in March and it struggled. Howeveronce the rain changed and it started to rain more this plant has just soaked the rain water up and quadrupled in size. The green is a very vibrant colour and it really is becoming the star of my succulent collection. I have taken a few offsets and will be growing these on to produce more offsets next year. I saw this at the Royal Botanical Gardens in Edinburgh last year and found it fascinating. They were selling it in the shop so I had to buy it. Dark brown leaves produce white flower spikes in the Autumn. It has struggled a little bit this year because I think I planted in a too sunny and dry position but since the rains it has rallied. I have already identified a more sheltered position where I will plant it next year. Where is a Blackbird when you need it? Time for the to finish there summer holiday me thinks. Well that is my SOS. 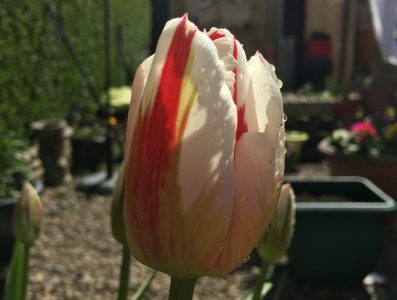 Just had an Email to say that my tulip bulbs and Alumiums are arriving soon. I had better start cleaning some pots out. As always to find out how six on Saturday works please follow the following link The Propagator. The don of six in Saturday. I don’t thinķk so Fred it is commonly known as Bugbane. There’s a whole tribe of The Enemy in my garden, which brings the fox in nearly every night to feed. You’re having a very busy autumn, for someone who can’t get into the garden. No foxes around here. All smokes and mirrors Lora. She I know I am coming up to a working weekend I always have at least 3 photo’s and stories in the bank from a weekend when Ì am off. Time management. Yuck! It took me a few to realize what that slug was. The famous banana slug lives here, but they eat decomposing foliage only. They would do some serious damage if they ate viable foliage! Jealous of your actea simplex. I tried to grow from seed this year but no joy. Will go again with fresh seed next year. It’s a great plant. Have you ever tried the slug nematodes? I am thinking of giving them a go. Your succulents and troughs look very good. Do you cover the troughs in the winter? I am assuming they are too heavy to move indoors. No will not be covering this one it will be ok as everything is hardy. My sister is temporarily moving into a house with a greenhouse so will put most of the other succulents in there. Like others I’m envying the Acatea as it looks wonderfully architectural but two words on google- ‘damp’ and ‘shade’ mean it isn’t for me! Love your dry trough. That looks great! I am thinking of making a grave into one. That is a brilliant idea. Was thinking about putting a succulent pot on my dad’s grave. Get yourself a little plastic painter’s kettle and half-fill it with some heavily salted water. Drop the enemy in as you find them. No messy chopping up if you don’t have wildlife to consume the bodies. Just a satisfying Alka-Seltzer effect as you drop them in and they fizz up and expire. Nematodes are good once the weather warms up but it’s often too cold for them in the early spring as the tender shoots of delphiniums and the like poke their heads above ground.Keep it in the shed or somewhere out of the way. The critters will dissolve so no need to empty it all the time – I generally empty mine just twice a year, down the drain. Your troughs are eye-catching with their variety of tones and textures — something succulents are superb at providing. I can see why you’re such a fan! Thanks….they can be so versatile. Your dry trough is a great success – I might follow your recipe and try one of my own! Totally agree with you about the importance of Rudbeckia in the garden although mine failed to get going this year. My Helenium has performed the same role. Thanks. I am delighted with the dry trough. Going to make another one next week.